1. In presenting Mary as a "virgin" the Gospel of Luke adds that she was "betrothed to a man whose name was Joseph, of the house of David" (Lk 1:27). These two pieces of information at first sight seem contradictory. It should be noted that the Greek word used in this passage does not indicate the situation of a woman who has contracted marriage and therefore lives in the marital state, but that of betrothal. Unlike what occurs in modern cultures, however, the ancient Jewish custom of betrothal provided for a contract and normally had definitive value: it actually introduced the betrothed to the marital state, even if the marriage was brought to full completion only when the young man took the girl to his home. At the time of the Annunciation Mary thus had the status of one betrothed. We can wonder why she would accept betrothal, since she had the intention of remaining a virgin forever. Luke is aware of this difficulty, but merely notes the situation without offering any explanation. The fact that the Evangelist, while stressing Mary's intention of virginity, also presents her as Joseph's spouse, is a sign of the historical reliability of the two pieces of information. 2. It may be presumed that at the time of their betrothal there was an understanding between Joseph and Mary about the plan to live as a virgin. Moreover, the Holy Spirit, who had inspired Mary to choose virginity in view of the mystery of the Incarnation and who wanted the latter to come about in a family setting suited to the Child's growth, was quite able to instill in Joseph the ideal of virginity as well. The angel of the Lord appeared in a dream and said to him: "Joseph, son of David, do not fear to take Mary your wife, for that which is conceived in her is of the Holy Spirit" (Mt 1:20). Thus he received confirmation that he was called to live his marriage in a completely special way. Through virginal communion with the woman chosen to give birth to Jesus, God calls him to co-operate in carrying out his plan of salvation. The type of marriage to which the Holy Spirit led Mary and Joseph can only be understood in the context of the saving plan and of a lofty spirituality. The concrete realization of the mystery of the Incarnation called for a virgin birth which would highlight the divine sonship and, at the same time, for a family that could provide for the normal development of the Child's personality. Precisely in view of their contribution to the mystery of the Incarnation of the Word, Joseph and Mary received the grace of living both the charism of virginity and the gift of marriage. Mary and Joseph's communion of virginal love, although a special case linked with the concrete realization of the mystery of the Incarnation, was nevertheless a true marriage (cf. Apostolic Exhortation Redemptoris custos, n. 7). The difficulty of accepting the sublime mystery of their spousal communion has led some, since the second century, to think of Joseph as advanced in age and to consider him Mary's guardian more than her husband. It is instead a case of supposing that he was not an elderly man at the time, but that his interior perfection, the fruit of grace, led him to live his spousal relationship with Mary with virginal affection. 3. 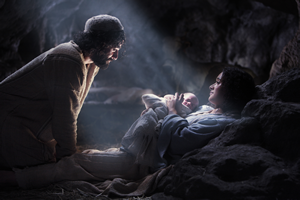 Joseph's co-operation in the mystery of the Incarnation also includes exercising the role of Jesus' father. The angel acknowledged this function of his when he appeared in a dream and invited him to name the Child: "She will bear a son, and you shall call his name Jesus, for he will save his people from their sins" (Mt 1:21). While excluding physical generation Joseph's fatherhood was something real not apparent. Distinguishing between father and the one who begets, an ancient monograph on Mary's virginity the De Margarita (fourth century) states that "the commitments assumed by the Virgin and by Joseph as husband and wife made it possible for him to be called by this name (father); a father, however, who did not beget". Joseph thus carried out the role of Jesus' father, exercising an authority to which the Redeemer was freely "obedient" (Lk 2:51), contributing to his upbringing and teaching him the carpenter's trade. Christians have always acknowledged Joseph as the one who lived in intimate communion with Mary and Jesus, concluding that also in death he enjoyed their affectionate, consoling presence. From this constant Christian tradition in many places a special devotion has grown to the Holy Family and, in it, to St Joseph, Guardian of the Redeemer. As everyone knows, Pope Leo XIII entrusted the entire Church to his protection.